Illumina’s series of impressive announcements at the J.P. Morgan Healthcare Conference fueled one of the most impressive stock price rallies in January. Depending on how you measure it, the stock market has generated returns in the neighborhood of 8% to 10% per annum over the long term. So when a stock returns a whopping 25% in a mere few weeks, something truly noteworthy is going on. 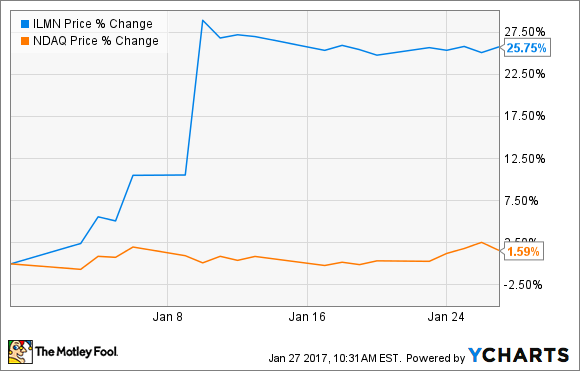 Thus far in the new year, shares of Illumina (NASDAQ:ILMN) are a top contender for the title of January's best-performing stock, outperforming its benchmark -- the Nasdaq Composite -- by an incredible 23%. So, what triggered Illumina's recent rally, and how should investors look at its stock going forward? In this article, we'll delve into both important questions. A series of impressive announcements at the J.P. Morgan Healthcare Conference earlier this month served as the central catalyst driving Illumina's January rally. Here's a quick synopsis of the four main announcements Illumina made during its presentation that sent its shares sharply higher. Illumina, in partnership with Bio-Rad Laboratories, announced a new product, the quite fittingly-named Illumina Bio-Rad Single-Cell Sequencing Solution. The new machine will be the first of its kind to allow researchers to study how individual cells contribute to a host of biological functions, including tissue function, disease progression, and response to treatment. Illumina announced a new partnership with Philips NV to develop new products and solutions "aimed at the acquisition, analysis, annotation, and interpretation of genomics data in oncology cases." Illumina unveiled its latest high-end new gene sequencing machines: the NovaSeq series. These new devices' improved throughput should help continue the company's long history of reducing gene sequencing costs. The NovaSeq sequencers feature several engineering innovations including redesigned optics systems, increased laser powers, and higher-emission dye designs. All told, these improvements lead to a 4x increase in scanning speeds, which should help the company continue its quest to lower genome sequencing costs to $100 per person. Illumina and IBM (NYSE: IBM) initiated a partnership to combine Illumina's cancer sequencing technologies with IBM's Watson Health analytics platform. By applying IBM Watson's analytics horsepower to the cancer cell examination process, this partnership could compress cancer analysis times from over a week today down to a matter of minutes. This host of new products is impressive, but it gets better still. After attempting to reignite its growth for much of 2016, Illumina CEO Francis deSouza also forecast that Q4 and full-year 2016 sales numbers, which will be announced on January 31st, will come in better than previously estimated. All told, this made for one of the most impressive days for the company in recent memory, which explains the pronounced pop it triggered in the company's share price. Illumina shares present an interesting dichotomy today, especially considering how dramatically this month's share price rally has altered its already-rich valuation. In one sense, Illumina's place as the leading hardware supplier to the genomics revolution seems as strong as ever, particularly given the impressive nature of its recent product and partnership news. We're clearly in the early stages of applying computer science to shape medical treatments. Unfortunately, investing in that growth certainly doesn't come cheap. At present, Illumina is expected to compound its EPS at an impressive 12% average annual rate over the next five years. Given the impressive nature of recent product announcements like NovaSeq, though, the company could quite plausibly see a renewed upgrade cycle in its diagnostics business, which would provide a further tailwind to its near-term growth. Perhaps more exciting, Illumina subsidiary Grail, which hopes to develop an early-stage cancer diagnostic test, hopes to tap into a $100 billion market if it can successfully create a reliable stage 1 test. Given all its potential, it should come as no surprise, then, that Illumina's stock trades at a premium valuation; its trailing and forward P/E ratios are 54 and 44, respectively. This steep valuation likely helps explain why the average rating among the 22 sell-side analysts who cover Illumina stock is a hold. Game-changing stocks are rarely cheap, something anyone well-versed in the art and science of investing in biotech and tech stocks knows only too well. So, while the decision of whether to invest in Illumina at its elevated valuation should come down to your own risk tolerance and view of its long-term growth potential, the company's impressive showing so far this month deservedly makes this biotech pioneer one of the best-performing stocks in January.